There’s a myriad of ways to record your research interviews. You could use your phone, laptop, or even a camcorder. However, I strongly recommend using a digital voice recorder. 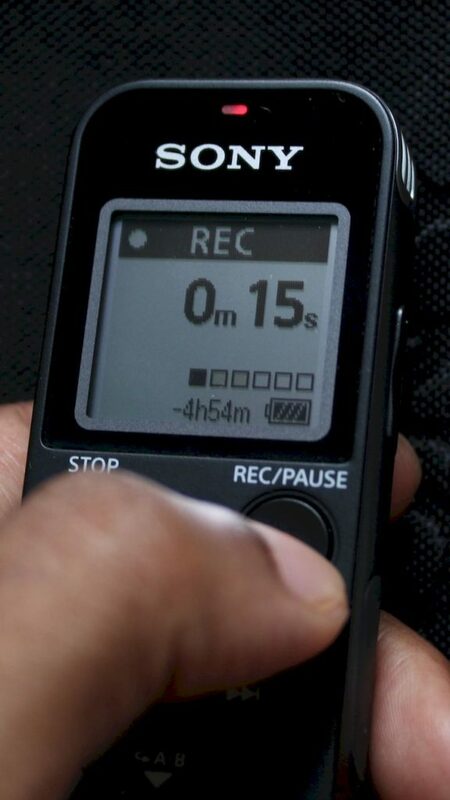 Handheld digital voice recorders are compact, affordable and enable you to easily manage the audio recordings, which makes the process of getting your dissertation interview transcripts easy and cost effective. Lightweight and low profile; powers up instantly; amazing sound; records in LPCM format; 3.5mm mic input with plug-in power; clear, sharp, and crisp LCD screen. Perfect for recording interviews. Stop shopping around and go and buy this beauty on Amazon! If you are looking for excellent interview recorder on a budget. 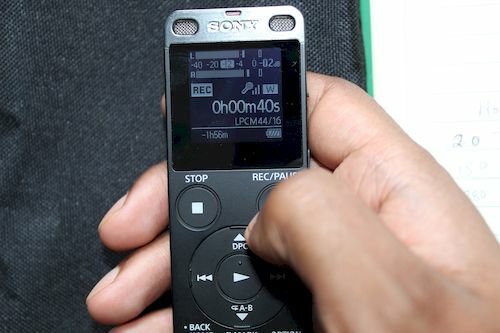 A very similar recorder to the Sony ICD-ux560, but larger and bulkier. Uses 2 AA alkaline batteries (no USB recharging), no backlight. 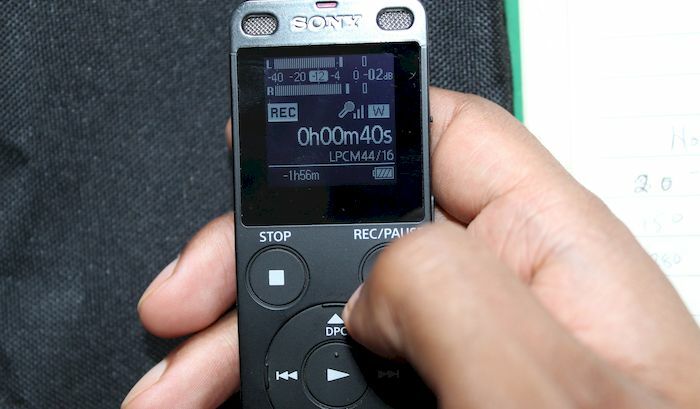 If you can’t afford the Sony-ux560, this recorder will save you some money. Check price on Amazon. Very good recorded sound. Lots of recording versatility – 96 kHz/24 bit wav. 2.5v plug-in power, 5v USB power, USB microphone. With accessories that you’ll need, a bit pricey, but a good professional (not for “newbies”) recorder for research interviews. Buy it from Amazon. The greatest advantage of digital voice recorders over older digital tape recorders is that they have no moving parts, which make a lot of noise. Thus, your interview recordings are crystal clear, which makes interview transcription easier. 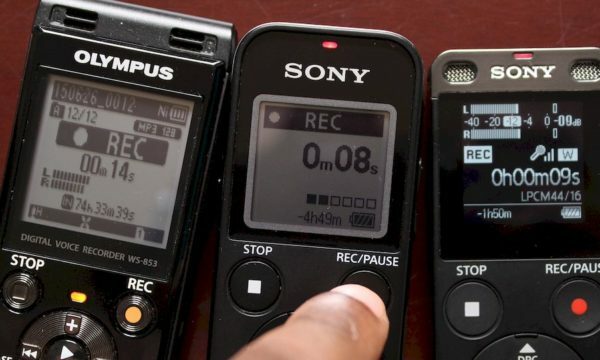 In addition, modern handheld digital voice recorders are less bulky, can hold more audio data (up to a 1000 hours) than their analog digital tape recorder counterparts. What are the 3 key features you need to look for when buying the best recorder for interviews? 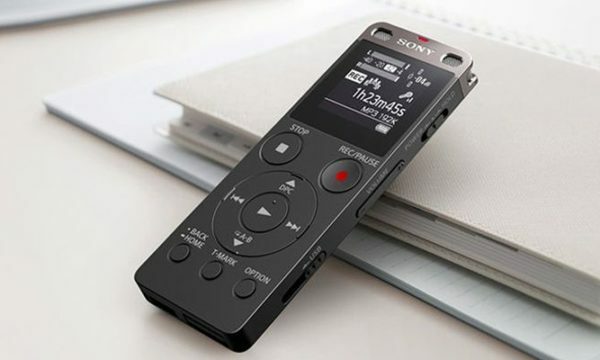 You want to buy a voice recorder that has both built-in memory and a memory card slot – which gives you virtually unlimited recording capacity. It’s okay to buy a digital recorder with a low built-in memory – you can easily increase the storage capacity using an external memory card. There are many different types of memory cards; Secure Digital, CompactFlash, MicroSD just to name a few. The most common digital memory cards are microSDHC, and microSDXC and store 4GB to 256GB of data. When choosing a memory card always check its storage capacity. However, the most important consideration should be compatibility. Always get a memory card that is compatible with your voice recorder. If you want to learn more about voice recorder microSD cards, check out this post. All digital recorders have built-in microphone(s). However, using an external lavaliere microphone enables you to record high(er) quality audio, especially in a noisy environment (here’s a great post on choosing external microphones). A microphone can either be unidirectional (cardoid) or omni-directional. Unidirectional microphones capture sound from a targeted source, while omni-directional mics capture sound evenly from all directions. 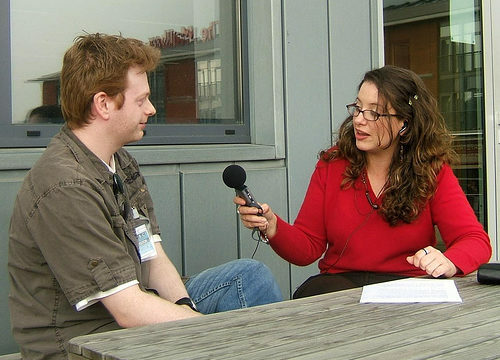 Unidirectional mics can suppress unwanted noise and are great for one-on-one interviews. Coupled with a high quality digital voice recorder (for instance the Sony ICD-UX560), you can also adjust and monitor microphone sensitivity/recording levels. Ultimately you want to choose a recorder with a microphone jack, the most common and compatible jack is the 3.5 mm jack. There are two types of audio file formats, compressed and uncompressed. Generally, higher data compression leads to lower quality sound. You should buy a recorder that allows you to capture uncompressed audio in PCM (wav) format. Pulse Code Modulated audio (PCM) is a file format that store the audio in its raw uncompressed format, meaning you maintain the original recording quality. High quality voice recorders enable you to record your interviews in an uncompressed audio format. Be Forewarned: The biggest mistake that researchers make when choosing a interview recorder: they buy one without a USB plug or external memory slot. Make sure the recorder that you buy has a USB port or an external memory card slot. 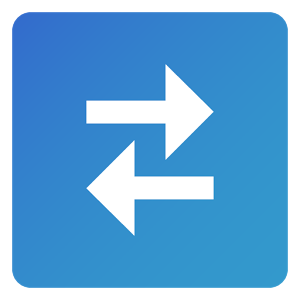 This will enable you to easily transfer your audio interviews into a PC/Mac, so that you can easily share them with your transcriber. Most (cheaper/older) low quality digital recorders (for example the Sony ICDB600, Olympus VN-7200, Olympus DP-201) don’t have this feature! Amazing little recorder that’s perfect for recording interviews. Records amazing sound. And you get even better quality sound if you record in the LPCM 44.1kHz format that this recorder supports. 4GB internal memory. If you plan to use it often, get additional memory – compatible with 128GB microSDXC cards (but 64GB microSDXC should be have more than enough capacity for most researchers). With the right settings, works well even in noisy locations (see this post for the settings I recommend). In-built battery…I could go on but here’s a detailed review. Stop shopping around and go and buy this recorder from Amazon. Great budget recorder. 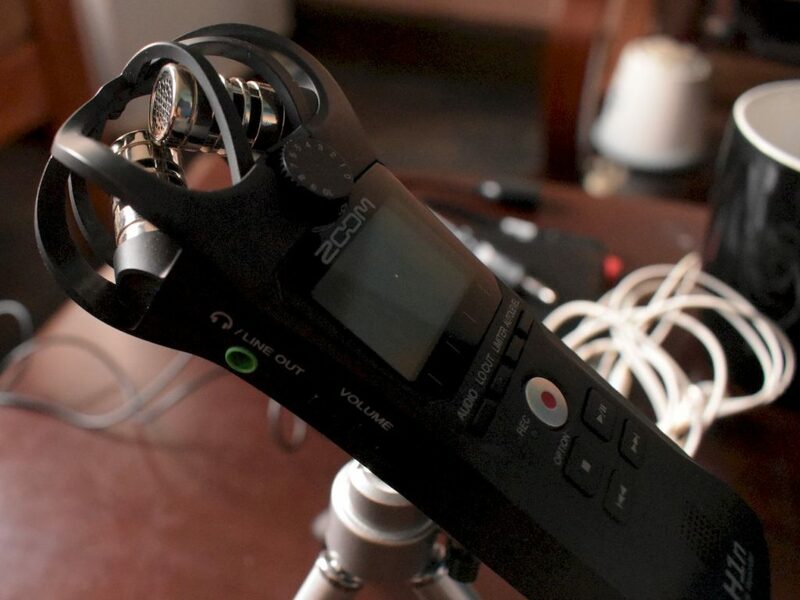 If you are looking for excellent interview recorder on a budget, this recorder is perfect. It records great sound, not as good as Sony 560, but close enough. And you get even better quality sound if you record in the LPCM 44.1kHz format that this recorder supports. 4GB internal memory. If you plan to use it often, get additional memory – supports microSDHC cards (4 GB to 32 GB). I bought a 32GB microSDHC for less than $20 on Amazon, and it works well with my Sony ICD-PX470. With the right settings, works well enough in noisy environment (see this post on the px470 settings I recommend). However, does not recharge batteries, no backlight…I could go on but here’s a detailed review of the PX470. Buy it now from amazon, you won’t be disappointed. The Zoom H1n is an entry level professional digital recorder that records very good sound, better than the older H1 version. As it’s geared toward audio professionals, it’s got a lot of features. Most of which you won’t use when recording research interviews, for instance the 96 kHz 24 bit wav recording format is overkill. Why do I recommend it? I really like the sound of the recordings. A minimalistic design – which I also like. It’s bulky, but fits like a glove to you hand; perfect for recording field interviews where you’ll need to hold the recorder up. Outputs 2.5v plug-in power – enough to power most external microphones. And you can also use it as a USB microphone. Pretty nifty. You are limited to 32 GB max (and it has no internal memory so you’ll need to buy a microSD card) and 10 hours battery life (and you can’t recharge batteries using this recorder). But you can power the Zoom H1n using a USB charger, which is what I recommend you do if you’re recording a long session. Here’s a detailed review of the Zoom H1n. If you have experience recording audio and want to step up your game, try this recorder – you won’t be disappointed. Are you are looking for a “plug and play” recorder? The Zoom Hn1 is not for you: newbies are not welcome. 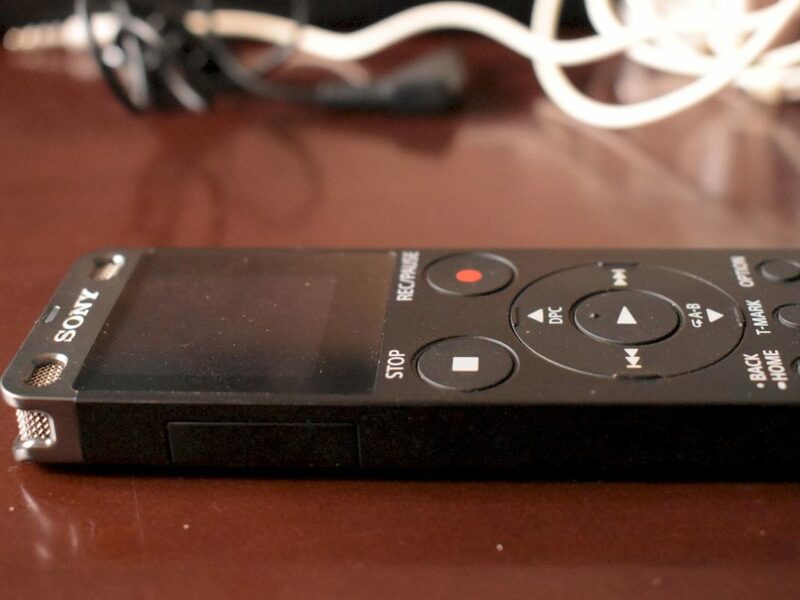 If you want to take your interview recording to the next level – get this recorder from Amazon. I’ve shared with you my top 3 recommendations for the best digital voice recorder. These choices represent my best advice when it comes to choosing a digital voice recorder to record your interviews. Researchers are pretty lucky these days, as high quality handheld digital voice recorders are more affordable than ever. I hope you see something you like in my recommendations. At the very least I hope they serve as a starting point for your quest to find a recorder that’s right for recording your research interviews. Please let me know if this post was helpful to you in the comment section below. And good luck while collecting your research data! Posted in: Best of, Conduct Better Interviews, Recording. Thanks, was looking for a field recorder for my dissertation research. This helped a lot! Glad you found the post met your needs. Keep us in mind for your research interview transcription needs. Could you please tell me which one you favored? What about the Panasonic model RR-US550 audio recorder, do you have any experience using it? Hi Erik, you’ll be fine with the Panasonic recorder. I don’t have any hands-on experience using it, but it’s a good recorder. All the best in your qualitative research. Just be careful with Panasonic. I have a Panasonic RR-US360 (which is probably a little old), but cannot get drivers from Panasonic for Windows 10. And Panasonic don’t even bother to respond. So now I have to purchase a new recorder! Douglas, that’s a 15 year old recorder – I’m surprised it still works! My pleasure. It’s about a year old so I do need to update it, but I am glad you found it useful. All the best conducting your interviews. My Zoom H5 is being shipped as I write. I will use it in a couple of weeks to record panel discussions in a university setting and assume the panelists will be seated facing the audience but don’t know where the moderator will be stationed. Id’ appreciate any advice on where to place the recorder (I’m not purchasing any additional microphones) for best sound quality. Hi, just wondering if you think it is necessary to use an external microphone with Olympus WS-823 if interviewing in cafes etc. ? If so can you recommend any in particular? Hi, guys! Have you ever used Roland recording devices? For example, something from R-05 series? I know they are of another price category, but I need a professional device at the moment. Roland is producing excellent equipment for musicians, as well as musical instruments, so I decided to choose one of his recorders. Is it worth? Could you please give me a piece of advice? I’ve never used the Ronald R-05, but I think it’s overpriced at ~$200. The zoom H4 has more features, multitrack recording, 2 XLR/TRS inputs et al. If you are looking for a potable musical instruments recorder, I’d definitely go for the Zoom h4 or H5. I would like the best ever recorder for a very sensitive and accurate field works for my dissertation research. Knowingly, that sounds that are to be analysed. This mean that when the word “tell” is recorded when spoken by someone, /t/, /e/, /l/ are going to be analysed. That’s why I need the best ever recorder regarding this work. Ramzi, the Sony ICD-ux560 will be perfect for your conversational analysis project. I recommend you read this post on how to record high quality interviews. All the best. I have transcribed an interview before, and it was not very easy. I could not hear very clearly at times, and rewinding was a pain, I needed a great recorder to do that. It seems that getting a recorder of high quality, and with a Sim card would be the best thing to do. Yes, transcribing low quality audio interviews is a pain! I like your advice to choose a voice recorder that has both internal and external memory options. Like you said, it’s usually fine to have a device that mainly relies on external memory cards because they’re affordable for the amount of data they can hold. However, I’ve found that it’s also nice to have some memory on the device itself as well, just in case the memory card runs into problems. Thanks for the article! i need to record memorie & most of digital voice recorder dont have play back & re recording option lets say i record for 10 minute but in middle i need to add or remove some part from that 10 minute can i do with digital device ? same as good old cassette player that record too ? Sara, what you are looking for is a recorder with an overwrite function. Here’s a great post on the top 3 recorders with overwrite functions that I recommend. What of HccToo 8GB Multifunctional Digital Voice Recorder Rechargeable Dictaphone Stereo Voice Recorder ? Is it recommended for a research interview? I’ve never used HccToo 8GB Multifunctional Digital Voice Recorder. But a did a bit of research on it and it looks like a piece of garbage! But that’s just my 2 pence. If you do buy it and use it to record your research interview, please let us know your experience using it. Just wanted to let you know this is super helpful! Your articles have been so helpful! Thank you! For my new job, I am conducting around 60 focus groups (with 5 to 10 people in the room) and around 100 individual interviews. The Zoom H4n or Zoom H5 seem to be good options for recording the sessions. I was wondering if you had any tips or suggestions for transcription. I am new to the interview/market research field and I am a bit overwhelmed by the idea of transcribing all the information that I will be receiving. Are there devices/softwares/apps that would help with the transcription? I like your tip to buy the Sony ICD-UX533BLK Digital Voice Recorder . If I’m doing a focus group with 8 people in a relatively quiet room, would I need additional microphones? Wrote 2 posts that you might find use. Here’s a post on how to record focus groups and a post on best recorders for focus group discussions. My husband has Alzheimer’s, early stages and I want to interview him about his life and memories before they are lost. Like the blitz in London and the partition of India, things our children and grandchildren might enjoy. I will need to transcribe it so being able to pause while my flashing four fingers catch up is necessary. What would you recommend? Thank you for this great information. I will be able to suggest the best voice recorder to my clients. My pleasure…btw it’s cheaper on Amazon (by about £20!). Dee, I’d recommend you get the WS-853. It’s very similar to the Vn-6200. In any case you’re due for a new recorder. Is the WS-835 or the Sony ICDUX560 Mac Compatible. If not can you recommend me a device that is compatible with an apple device. Also, how easy are they to use. I am not that tech savvy. Yes Eric, the Olympus WS-853, Sony ICD-PX470, and Sony ICD-ux560 are Mac compatible. Just plug in the USB, find the device in the Finder menu left column, open it, and find the recording. Then drag & drop the recordings to your desktop, or anywhere else you want to store them, click on them they’ll begin playing in iTunes. Now, your Mac/Apple device might not have a standard USB Port. That easily solved by getting the appropriate USB cable. What Mac device do you intend to use? And I found the ux560 to be the most user friendly. Thanks. I currently have a macbook air and it has the usb slot. I may upgrade to a macbook Pro sometime later this year but i do not know. Thanks for the quick reply. Great. If you do upgrade to the Macbook Pro, you’ll need to get a USB-C to USB adapter to connect the recorder to your Mac. Other than that, it should work fine. I am looking to recored college lectures and upload them to my computer so I can listen later on. I don’t want to go overboard but I will be recording from a distance of about 20 feet and using it about 3-4 hours a day. Which recorder would you recommend. Hi Isaac! Thanks for a super useful post. I am just wondering what are the advantages/disadvantages of mono and stereo recording of interviews and focus groups? Can one make it easier to transcribe than other? recording & listening in stereo helps (somewhat) when trying to understand what’s being said when more than one person is talking at once. I record large (25-person), somewhat rowdy meetings and a wide-panned stereo setting definitely helps. If recording interviews into the the Sony from an iPhone or computer video conferencing software (e.g.Skype), what kind of splitter(s) will I need? I am looking for a recorder that I can use to record over the phone conversations for a radio show I have. Any suggestions ? Would like something of good quality because it needs to go as a radio show and possibly a pod cast. Jill, I’d recommend the Sony. Because it can record in the Wav format = very good quality audio. Now, depending on the type of phone you are going to use to record the radio show, you are going to need to connect the recorder to your phone. If you are using a landline phone, you will need to get an adapter. If you plan to use a smart phone, you’ll need a splinter and mic cable to plug in the recorder. I recommend that you read this post on how to record phone interviews. I have heard that the 2 Olympus digital voice recorders you recommend are not available at some stores because of upgrades. Can you tell me if there are upgraded versions of these? I heard the Olympus DM-270 was better, for instance. I will want to get transcripts from you (depending on price), and then upload the recordings themselves and also transcripts (not necessarily synched) into NVivo11. For a series of 15 interviews. What do you think would be the best for this scenario? Thank you for this valuable information. I will get one for my study. Re the Sony you say “Especially if you foresee recording your interviews or focus groups in non-ideal conditions (little or no background noise).” I will be working in non-ideal conditions, which I consider to be a great deal of background noise. Are you only recommending this recorder for conditions where there is no background noise? Thanks. And sorry for the confusion – the phrasing was oxymoronic. I’d recommend the Sony if you plan to record in locations with background noise. With the right settings, it does a pretty good job of cutting out background noise. Here are the settings I recommend when using the Sony. If you plan to record interviews in a location with a lot of background noise, I’d recommend you also get clip-on microphones. Here’s the post on how to record interviews in a noisy location. I am planning to get the SONY ICD-UX560 for my one-one research interviews. Thank you for the very helpful information on here. Is there a specific external microphone you would recommend for this model? Hi Susanna, thanks for getting in touch. I’d recommend a clip on microphone aka lavaliere microphone. They are great for recording 1-on-1 interviews in noisy locations. I’m testing a few of them, and ordered a few more – haven’t found the perfect clip on mic:yet! I did find the best clip on microphone to use with the Sony ICD-ux560: the Giant Squid, here’s my review of the microphone. I’m also interested in this. I bought a Sony ICD-UX560 and will be conducting one-on-one interviews. I’m assuming I need two mics (one for me, one for my interviewee) plus a splitter and will greatly appreciate your advice on both the mics and the splitter. I start my interviews Aug 6 (yikes!). Lucy, you’re right. You are going to need 2 lav mics and a splinter. I was going to recommend an Olympus one, but it only comes bundled with the ME33, yikes! I recommend the Hosa spliter cable (Amazon link), tested them and they work really well. For the clip on mics, I recommend you get the Giant squid clip on mic (link to my review). Tested it and works very well with the Sony ICD ux-560. And here is a how to post on how to record interviews in noisy locations. 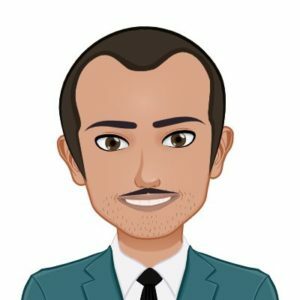 I will be doing interviews of people for research. I would like to have crisp recordings so I have a good chance at getting them accurately transcribed. Over time, I imagine that some of the interviews will be done on a landline, sometimes over my cellphone,perhaps sometimes in person or Skype. Is there an all around recording system you would recommend that I can plug into my computer, landline or cell phone. Is this asking too much of a device? Am I looking at 2 or more devices? Hey Emily, a few post that will cover most of your scenarios. For Skype interviews, here’s a great post on how to record Skype interviews. Here’s a detailed post on how to conduct telephone interviews. That’s for landline and cellphone interviews. For in person interviews, I recommend the Sony ICD-ux560, here’s a detailed review of this recorder. I plan to interview people via a cell phone. Can you recommend the best recorder, transcriber (and anything else that I might need)? Thank you for your time and assistance. Vicki, I’ve always recommended using a quality app for recording cell phone interviews. And they’re lots of them for iOS/Android phones. Here’s a detailed post on how to record telephone interviews. And consider our interview transcription services. Really helpful. Only query I have is, is it possible to password protect the recorder? I’ve penned a post on the best encrypted voice recorders with password protection. Fab many thanks… thought so..probably will take your recommendation of the sony…it looks the best, and easy to use. i have just brought the Sony UX560 – it states that is records for 1hr 23mins. I have 3 back to back interviews that will not exceed 1hr but do i have to download each recording before the next or will this device enable me to record 3 back to back interviews at 1hr per piece? otherwise your feedback has been great – thank you. Hello, Did you try the sony TX650? it is smaller but more expensive than the 560. Considered it, but I’ve never tested the TX650. It’s smaller, but lacks a microSD card slot and a mic plug – which limits it uses in an interview setting. I’ve heard good things about the TX650 from a wedding videographer…and the TX800 is a newer, better(?) version. Your analysis is really helpful, I’m considering buying a recorder for my Doctoral dissertation interviews. I would like to ask if you have any recommendation about recorders with transcription technology embedded.